Large recently renovated studio just steps away from the white sand beach and warm emerald blue waters of the Gulf of Mexico. The complex is a New Orleans inspired design with courtyard, beautiful landscaping, and heated pool. All just for your enjoyment! The unit is professionally decorated and furnished with a queen bed, comfortable sitting area with queen fold-out couch, kitchenette with granite countertops, full refrigerator, stovetop, microwave, small oven, and all utensils for your cooking needs, including BBQ utensils. There is also free wireless high-speed internet available, cable TV, linens and towels, as well as some beach accessories for use. The unit is ground floor, however it is not designed for handicap use. This great central location provides easy access to a wide selection of activities including water sports, fishing at Redington Pier, shopping, theme parks, outlet mall, museums, professional sports, casino boat trips and world famous John's Pass Village, as well as casual and fine dining. The beach trolley comes by every half hour and is a great affordable way to take in the sights around our stunning beaches and downtown attractions. Amazing sunsets and tropical breezes along with a relaxing quiet atmosphere makes this the perfect Florida getaway vacation choice for you and your family. We love staying in this unit. 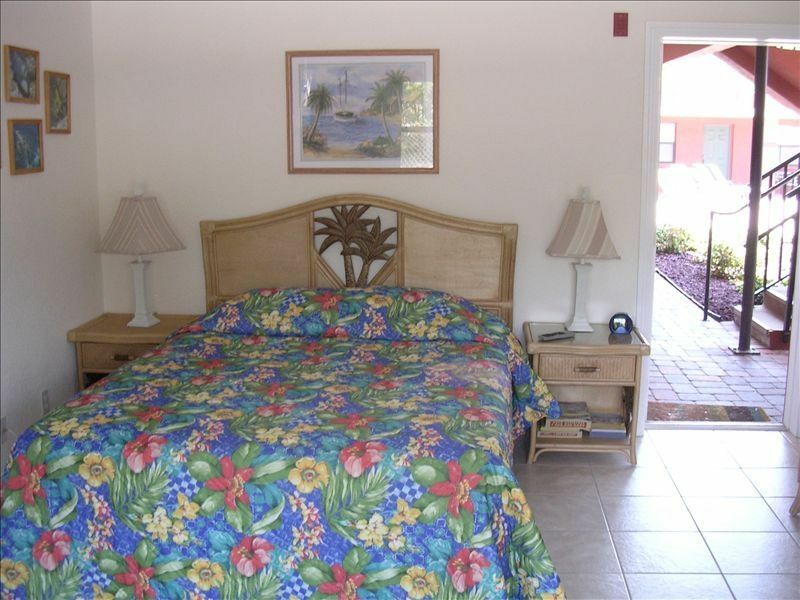 It is so very comfortable and convenient to shops, and the beach which is right across the street. The heated pool is so lovely and warm. Only problem was STRONG tobacco smell and a better lock box. Other than that it was a comfortable place. We have stayed in a number of condos at this particular location. We very much enjoy the area. It is quiet and convenient to a number of sites between Clearwater and St. Pete. This condo is cute and has all of the amenities promised in the description. The price is certainly right (and does not overcharge you in additional fees). We arrived at 4:15 and immediately went to the Conch Republic to eat. While we were gone, we got a call that the condo had not been cleaned and that someone would be coming to rectify that. The condo was thankfully left in clean condition from the previous renters. That said, it was a bit inconvenient. On the other hand, the situation was quickly resolved. The couple that came to clean was very quick and efficient. They were also very friendly. So, my overall impression of the condo is 4/5 for ease of booking, relative cost/value, and location. My rating was negatively impacted by the cleaning situation. Additionally, this is the first time visiting this site that we've had any negatives with the "neighbors". There were 2 situations in which the neighbors were less than respectful of a site of this type: a dog, not on a leash, jumping all over us and a family that was not courteous of volume and left their pool materials in the pool after they vacated it. So, again, this condo specifically would be 5/5 if not for the cleaning issue (that was quickly rectified). The other issues are beyond this condo but are specific to the complex. I would recommend this condo to others and will stay here again in the future. Great clean condo. Great location. We had a great stay at this condo in Redington beach. Unit was very clean, and it was equipped with every thing we needed. Owners were very accomadating, and communication was spot on. Would recommend. Liz, Thank you very much for taking the time to write this great review. Our goal is to give all our guest a wonderful vacation experience. Just checked out of #108. Nice corner unit on the ground floor. Perfect size for 2 people and very reasonable pricing! Courtyard with the pool is beautiful! Beach access is very close, just a short walk. We recommend Conch Republic for dinner! It was delicious and only a few blocks away, within walking distance. Only thing I would suggest for this unit is to provide beach chairs and maybe an umbrella for guests. Luckily we brought our own but for future guests it may be a good idea. We would definitely stay here again and recommend to others. Thank you for the great revue it is always a pleasure to hear that our customers have enjoyed their time in our condo. There is a 12% local tax and a cleaning fee of $65.00 per stay. Please email a request to the owners Jon and Cindy Pershall.